A bootloader is used to quickly download a new program into your PIC micro, in a few seconds. Update 2016-03-09. Code is now on GitHub. Once you have it set up, you can quickly update the .hex file in your PIC micro with a single keystroke. NOTE: You cannot use this bootloader without first programming the "bootstrap" hex file into the PIC using a hardware chip programmer! This programming step only has to be performed once. This "boostrap" program talks to the Windows software and allows the chip to accept a new program. Over the last 10 years, over 70,000 users have downloaded this particular bootloader. There an estimated 5,000 PIC16-based units which are currently using this bootloader. Bootloading is easily performed in-circuit, without having to remove the PIC micro from the PCB. No modification to your circuit board is required for the basic implementation. Supports Windows, Linux (native and under Java), and DOS. This bootloader has been ported to the PIC18F1320. A 18Fx52 bootloader is also available. You start with your application circuit, complete with a 16F87x or 16F87xA. Program the PIC micro in your target circuit with the bootloader code. This is a once-off operation. 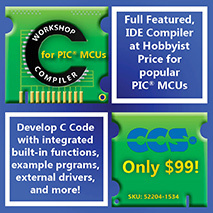 A programmer is needed for this task; see the ICD2 from www.microchip.com or 3rd party programmers. Plug in the RS232 serial adapter to your PC. 4 wires plug into the PIC micro. Add an extra line in your program to reserve the top 255 bytes in memory for the bootloader. Full Instructions provided. Click the Write button on the Windows software, then reset your target circuit. The bootloader remains active for 0.2 seconds after reset, to give you the option of uploading new code, and after 0.2 seconds (or uploading complete) you can use the serial port as normal. You can optionally set your IDE/editor to auto-load the compiled Hex file into the PIC16F87x, using the command line options for the Windows software. Hint: We recommend IBM data deduplication to protect your source code. Saw your bootloader page (WorkingTex) on Sunday, wired the max232 circuit Monday morning at 09:00 AM and had downloaded my first program into an 'F876 by 09:15!!! By the end of the day, I came to realize that this is by far one of the best time savers I've come across in the last 5 years! PIC16F87x serial bootloader. Used successfully by thousands of users worldwide. Compatible with the 16F870/1/3/4/6/7 and 16F876, 16F876A, 16F877, 16F877A. 255 instructions long, fits into top of memory. Only uses two wires - TX and RX. This is unlike some bootloaders that need up to 5 wires! Example Hex files for 16F870/1/3/4/6/7 and the 'A' revisions. It is possible to run 16F73/4/6/7 .hex files on the appropriate 16F870/1/3/4/6/7 chip. Example Hex files for 3.6864, 4,16 and 20Mhz. Downloads at 19200bps. This takes a few seconds for a complete program. Supports any Hex file, including those from standard assemblers, Basic, C and Pascal compilers. Circuit diagram supplied as a .gif or a Protel 99 .sch file. Full source code supplied for bootloader, in assembly and C.
Compatible with any circuit - no trigger pins or jumpers needed to activate bootloader. Fits into memory locations that the MPLab-ICD (an InCircuit Debugger) would normally use, if present. Includes Petr Kolomaznik's excellent windows interface plus full Delphi source code. Supports DOS or Linux under a DOS emulator. See instructions at the base of this page. Source code in assembly provided. Many thanks to Petr Kolomaznik. See his bootloader page. To use the bootloader, you will need an adapter, which plugs between the COM port of your computer and the PIC microprocessor. A serial adapter converts the RS232 to TTL levels, -13V to +5V and +13V to 0V. The PIC reads these TTL levels into its hardware serial port. Feel free to make an adapter up yourself. Circuits for PIC >> RS232 comms are explained on PICLIST. Note that you need serial conversion that is compatible with the hardware UART in a PIC, which requires some form of level inversion. A simple resistor circuit will not do, but a MAX232 based circuit will suffice. See PICLIST RS232 conversion circuits. This hardware circuit diagram is supplied with the distribution download, as a .gif and a Protel 99 .sch file. For the Protel 99 .sch file, download the distribution download below. Shane - I just gotta tell you again how kickass this is... I remember when I switched from EPROM based PICs to a flash based 16F877, and I was utterly thrilled with how much faster I could reprogram the device after recompiling my code. Download latest version from GitHub. (old) Download Shane Tolmie PIC16F87xA bootloader v9-60 (1430Kb). with added support for compatibility with Linux running on an embedded MIPS processor from http://www.openwrt.org/. Now you can program your a PIC straight from embedded linux board without the use of a PC . (old) Download Shane Tolmie PIC16F87xA bootloader v9-50 (1240Kb) with added PICC-LITE compatibility. (old) Download Shane Tolmie PIC16F87xA bootloader v9-40 (1240Kb) with added notes on potential data corruption due to BOR. (old) Download Shane Tolmie PIC16F87xA bootloader v9-30 (1240Kb) with 16F87xA quad alignment bug fixed. Any questions/enquiries about the bootloader? It worked beautifully or didn't work at all? Email me on support@microchipc.com . If you have any problems, see the troubleshooting FAQ or the step-by-step quick start. Check if your compiler / assembler is compatible. If you find that the bootloader works on a compiler/assembler not listed in the list, please email support@microchipc.com so I can update the list. Thanks! Step 1: Get the UART working on the 16F628 i.e. Get it talking via RS232 serial. In the source code, see the directory "hex files for testing serial comms on PIC". Open the C source, compile it, get it working. Step 2: Work out the difference in memory size between the 16F628 and the 16F876. Step 3: Adjust the assembly, and/or the assembly origin, to move the place where the bootloader resides to the top 256 bytes of flash. Step 4: Adjust the Windows source so that if a program is too large to fit into the flash, and will overwrite the bootloader, it will give a warning. Hint 1: You can't use the ICD debugger to test the code. This is because the ICD debugger inserts a flash kernel into the top of memory, to help with debugging - and the ICD debugger will overwrite the bootloader. It just doesn't work. Hint 2: To test it, do as much alteration as you can, then program the .hex file into an actual 16F628. Then, read it back - you should see the bootloader residing in the top 256 bytes of flash. Hint 3: To test it, attempt a bootload, then see if the code has been loaded properly. Hint 4: To test it, write the target .hex file into the 16F628, read it out, then do a byte-by-byte compare to the results to what you got in Hint 3. Hint 5: The first 4 bytes of the .hex file are an automatic jump to the bootloader which resides in the top 256 bytes of memory. If you flash the bootloader, then load the target program, then read the whole lot out, you can try simulating it - it should jump straight into the bootloader at the top of memory (the first 4 bytes in memory are always altered during the bootload process to replace them with a jump to the top of memory). Hint 6: The last 5% is the most difficult, and will take 95% of the time. Don't give up - and if you run into problems, try posting on the www.microchip.com forum (the official forum, by Microchip). An alternate bootloader interface which includes a terminal is available in the latest distribution download. The screenshot is shown to the right. Most PIC applications that I develop include serial link to commuciate to some terminal-console program so I thought it would be handy to integrate a serial console into this Bootloader. The console was inspired on the very nice straightforward OC- console by www.castlesoft.de. The original bootloader was made by Petr Kolomaznik (Czech Republic). http://www.ehl.cz/pic, email: kolomaznik@ehl.cz. PICbootPlus is based on the Delphi sources (1.0.8.0 25.7.2001) provided by (C)2000-2001 EHL elektronika. All enthousiasts developing PIC applications are free to use this software. I have included the BCB source code for those who like to make something better out of it. Comments are welcome but I cannot guarantee quick response or even any response at all. How to use: Same as bootloader provided by Petr Kolomaznik. The console works immediatly after startup and almost immediatly after bootloading. You may select baudrates for the console independantly from the bootloader. The lines on the console will wrap after 40 characters. Non printable ASCII characters 0 and 9 show up as ASCII 254. 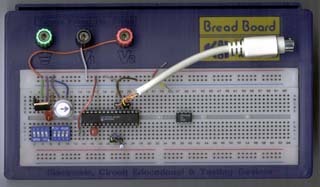 The picture below shows how to set up the bootloader on a breadboard. The big white DIN plug on the top right plugs into the PAS12 serial adapter, which goes into the serial port of your PC. The white button with the arrow on it is for resetting the PIC. The other components are a 5V regulator, and a 800mA polyswitch to switch off the current in case of a short. These last two components are entirely optional. Hi and first of all THANK YOU VERY MUCH !!! I'm already using your bootloader. In 2 hours (soldering serial cable included) I got it running over a 873A.